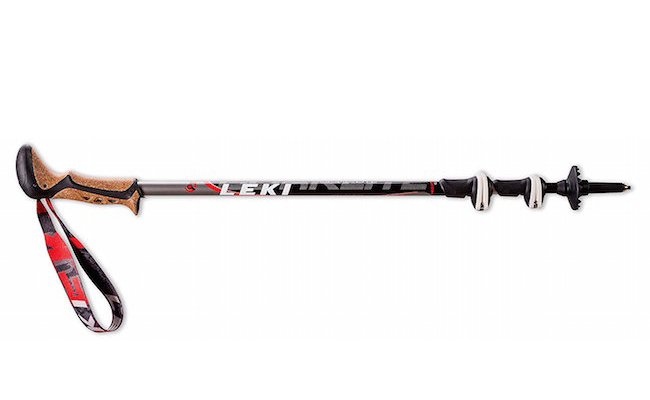 We received many requests to test the Sportsun Trekking Poles , so we decided to give them a try. If you would have given us these poles without any branding, we would have thought they were the JESBAN VOROSY trekking poles we have reviewed. These poles are designed exactly like the JESBAN poles from grip to handle except the are made of aluminum rather than JESBAN carbon fiber. We received many complaints that the product did not come as advertised and several complaints of fake and false reviews. When we did our own diligence on Amazon.com, we did in fact uncover several misleading reviews. In some instances, the reviews were for other products. The manufacturers of Sportsun Hiking Poles boast high quality aluminum alloy material that is sturdy. We were not impressed. One of our poles was easily bent when it got stuck in between a crack during our trail test, even though they are made of a heavier aluminum. If you are going to purchase aluminum poles, you are better off going with Montem or Life in Motion trekking poles. The handles are EVA foam, sweat-absorbent and comfortable if used for a short time. 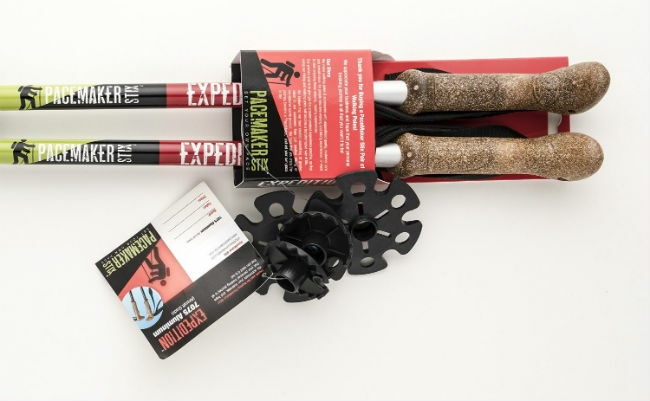 Most serious hikers would prefer cork handles. The poles have durable tungsten steel tips to for rocky and challenging terrain as well as rubber feet for flat terrain. There is an optional mud basket for softer surfaces. 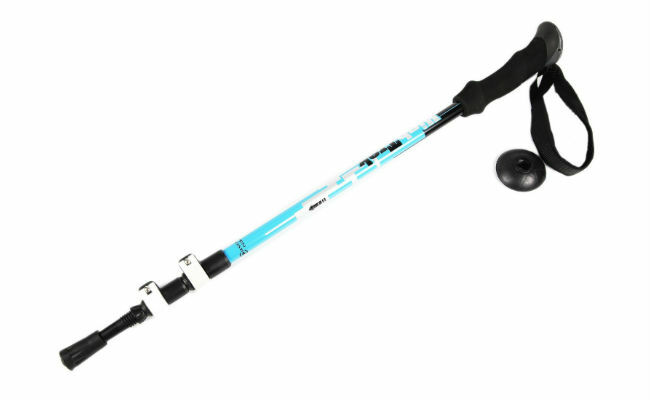 The Sportsun Trekking Poles can be adjusted from 24 to 55 inches, and they employ a “flick-lock” arrangement that is similar to the locking system on the Cascade Mountain Tech poles. Tough tips are featured, made of an extremely sturdy rubber with preformed indentations to ensure grip on uneven and soft terrain. There are also trekking baskets which are attachable to the main footing to assist in travels through mud or soft surfaces. The poles claim to have an anti-shock feature, but that is misleading. These poles do not have anti-shock. We were surprised that they would claim this. One reviewer even called them out specifically saying “Not as advertised………does not contain ‘spring action design’ to reduce stress on joints as described in website.” That being said, the design is pleasant featuring a nice light blue and black color scheme. 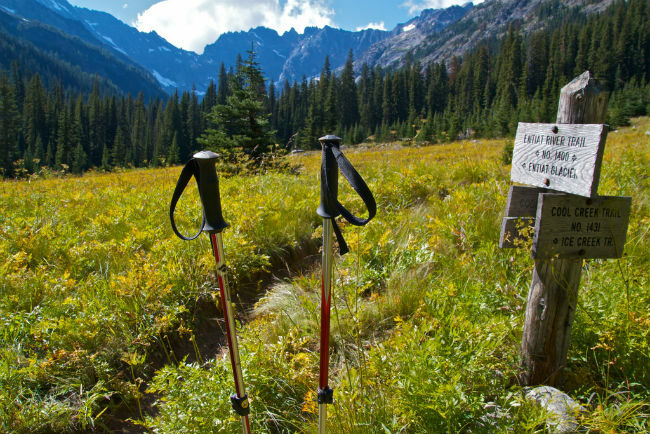 Sportsun Trekking Poles are what many would consider entry-level / one-time-use equipment. They’re intended for light or occasional use, not for regular trekking over serious terrain. Contrary to what the reviews say, these poles aren’t the strongest on the market. Please be aware that there have been several false reviews and even more fake reviews supporting the use of this product. We tested the product and we would not recommend this product for even entry level hiking. We found the handles uncomfortable in hot conditions, and the locks were not able to maintain the desired pole heights (this seems to be a common occurrence, regardless of manufacturer). In terms of trekking equipment, these poles are towards the the lower price range. You can purchase them at Amazon.com . This is a classic “you get what you pay for” item. They are poor quality and can get defective quite easily. The handles were not comfortable. They tend to break and snap very easily. Also, the locks did not work sometimes. They are cheap and low quality and we would not recommend for any serious hiker. Equally concerning is the way they are actively looking to trick the consumer with their false product reviews.